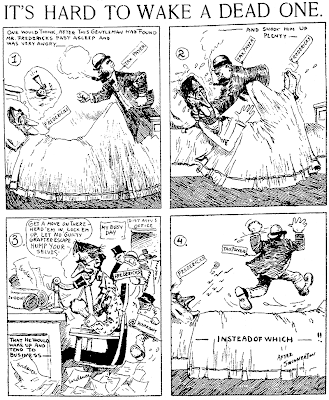 Both cartoons were printed in the March 4 edition of the LA Examiner, an issue that was in pretty bad shape on the microfilm; lot of restoration work but the results are still sub-par I'm afraid. Up top we have Herriman commemorating an exhibition game between the New York Giants and the Angels. The New Yorkers were all complaining about being stiff and tired after their 3000 mile rail journey and so only beat the Angels by a pair. Anyone have an idea who this Samivel (Samuel?) Crane fellow is? The second cartoon, an editorial, has Herriman complaining about the DA's apparent lack of interest in the Examiner's charges of corruption in LA's road-building endeavors. Why George feels the need to credit Jimmy Swinnerton on this cartoon is a mystery to me. PS - the images above are PNG graphics rather than JPGs. If anyone has trouble viewing them or notices any other odd behavior please let me know. Samuel Crane was both a baseball player of the 1880s and, later on, an influential sports journalist, which probably explains the folks hanging on his every word. If you google him, there's a ref to him testifying at a baseball player's trial late in the teens. Last one, I promise. This has the revealing fact that Crane worked for the New York Journal, another Hearst-owned paper. My apologies to regular readers of this blog. Beset by a perfect storm of business obligations, (paid) writing obligations and a flaky internet connection I haven't had so much as a free moment to do any posts. Look for the Stripper's Guide blog to resume, at least spottily, later this week as I whittle away at an enormous workload. In the meantime, if anyone reading this happens to be in the know about getting grants for doing scholarly research I'd really like to have the opportunity to pick your brain. I started on a magazine article and it's becoming apparent that it could be turned into an excellent book if I had the time and backing to do further research.